When it comes to all crops, whether it is canola, cereals, peas or other pulse crops, ensuring you are hitting target plant densities is not only top priority, it saves you money. Thousand kernel weight (TKW) or thousand seed weight is a measurement with which most producers should be familiar. It determines the size of seed which varies between not only crop type, or variety but also between seed lots of the same variety, perhaps from the same grower. TKW is needed in order to calculate your seeding rate to ensure you have enough plants, and that you are not exceeding costs. Knowing the germination rate is the next step. Many labs across Alberta have quick turnaround times for germination and vigour and will also provide a TKW. Vigour, which represents how many germinated seeds will form healthy plants, is a preliminary estimate of mortality. Mortality in peas and lentils tends to be less than cereals and canola, and can be assumed at five per cent (mortality is influenced by seed/soil contact, seeding speed, seed depth, soil conditions etc). The remaining pieces of information required for the calculation is your target plant density and drill/planter row spacing. 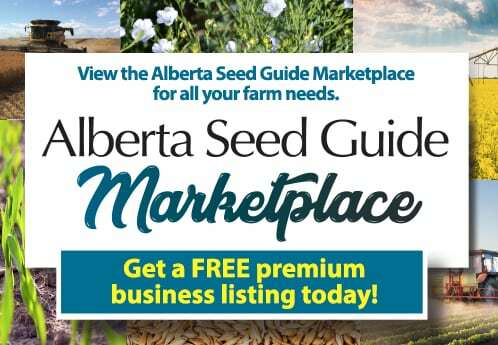 Alberta Agriculture and Forestry has a handy online seeding rate calculator that you can plug the information into, and can also be used for budgeting your seed cost. The calculated information includes the seeding rate in lbs/acre, allowing for simple calibration of drills and planters, as well as a seeds per row foot number. This number allows you to check one foot of your seed row upon emergence and assess your plant stand establishment and may also help back-cast to better calculate mortality. Why does this matter? Depending on your seed size, your target plant density and seed cost, your seeding cost can vary greatly. When choosing varieties, small seed sizes inherently cost less than larger ones when seeding, providing germination, vigour and mortality are constant. Good agronomic practices including knowing your germination and vigour, seeding at appropriate speeds to moisture ensuring good soil to seed contact in all crops will insure you are making the most of your seed input. Target plant populations are important, and that is why Alberta Pulse Growers is assessing the age old adage of seeding rates with our Plot to Field research protocol. A penny saved is a penny earned, and in our industry, margins are slim. Click the link below on the Alberta seeding rate calculator to see the difference TKW, target plant populations, germination and mortality can have on your seed cost when you play with the numbers. Make sure to get the best start to #plant18!